China has announced a ban on all ivory trade and processing activities by the end of 2017. Conservation groups hailed the decision as "historic" and a "game-changer" for the future of elephants. The move follows a resolution at the Convention on International Trade in Endangered Species (Cites) in South Africa in October. China has the biggest ivory market in the world - some estimates suggest 70% of the world's trade ends up there. 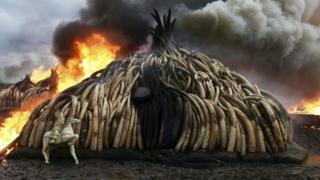 Ivory can reach $1,100 (£850) per kilogram in China. China's State Council announced the details of the ban on Friday. The commercial processing and sale of ivory will stop by 31 March, and all registered traders will then be phased out, bringing a full halt to the market by the end of the year. Conservation group WWF welcomed the latest news, calling it a "historic announcement... signalling an end to the world's primary legal ivory market and a major boost to international efforts to tackle the elephant poaching crisis in Africa". Elly Pepper, deputy director of wildlife trade for the Natural Resources Defense Council, praised China for its "great leadership" on the issue. "Setting such an aggressive timeline to close - once and for all - the largest domestic ivory market in the world is globally significant. "It's a game changer and could be the pivotal turning point that brings elephants back from the brink of extinction," she said. While the international market in ivory has been closed since 1989, legal domestic markets have continued in many countries around the world. A surge in the killing of elephants over the past seven years has seen populations across Africa shrink by a third, according to the recently published Great Elephant Census. China had backed the Cites resolution in October, surprising participants with the strength of its support for a ban. Some delegates said Beijing had wanted an even stronger resolution.